Hello people. I crashed my drone about 30 minutes ago. It is night time. This is the Flight LOG. Please help me. I searched for it but I cannot see in dark and it’s snowy. The aircraft was landing at the last entry in the log. Without going in to the wrecklessness of your flight ( As you should already be aware of ), as the aircraft was landing ( Still at a very high altitude ) My guess is that the battery shut down since the battery values were critical at this stage. That said, you should look basically straight down from your last GPS co-ordinance, roughly in the area of the red circle below. It did not appear to be drifting at a significant rate, so either it landed, or more likely tumbled down powerless. Thank You for the answer. I just searched the whole area with two more people. It seems like its lost forever. I’ll have to search again more thoroughly tomorrow morning. I am aware of my actions and I take full responsibility. It just looks strange to me, the AC was descending fine until suddenly it stopped doing so - descending with a speed of only about 1 km/h, previously 10 km/h I think. Going back to physics, I have no data for wind, can’t find it. So it was around 370m of altitude, and the last time it recorded the coordinates, as you said, it did not seem to drift away. So, with some kind of logic, it fell down like a rock, with its 350 grams of weight. Could a strong wind even move it? It fell into snow presumably, because it snowed pretty hard today. What do you think? Can I extract somehow more data? 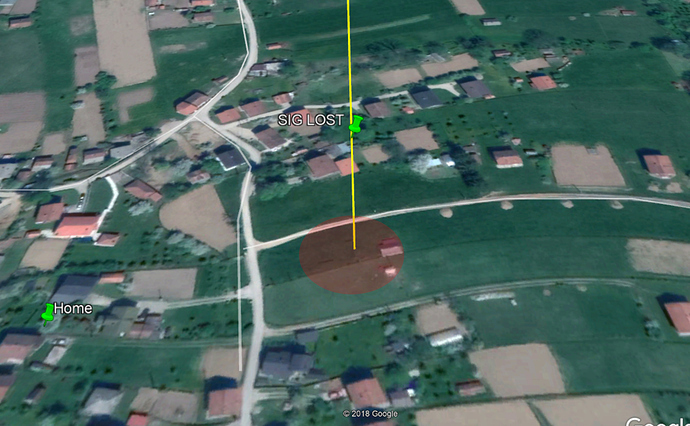 I see the green pin pointed near that house but I am not even located there but around 50 meters away. You took off before the home point was established. That is why it is where it is. It did not update until 28 seconds. Going back to physics, I have no data for wind, can’t find it. So it was around 370m of altitude, and the last time it recorded the coordinates, as you said, it did not seem to drift away. So, with some kind of logic, it fell down like a rock, with its 350 grams of weight. The wind did not seem to be a factor. As I mentioned it should have fallen pretty much in a direct path from the last signal recorded. Can I extract somehow more data? Unsure with the Spark, but some of the newer aircraft do record a .dat file on the device. It has a little more than the .txt file, but in this case, since the log ended as it did, the only other usable data is on the aircraft itself. @msinger Your thoughts on the search area? Your thoughts on the search area? I’d start at the last known location (44.29322655, 18.8559343) and search from that point outward in a circular pattern (as you suggested above). It was too high in the sky to make it to the ground before the battery shut off. Plus, it wasn’t descending very quickly since the downward sensors were detecting an obstacle below. I wasn’t aware that a spark had that much range. Just taking another look. The VPS signals do look odd, but that may or may not have an effect on the issue. Looking at the data here, you can see full down throttle and the non-responce from the RC due to force landing, that was very slowly ( As expected ) descending. I will presume for the moment that down throttle during autoland, or force land will have no effect on the AC. On the other side, up throttle will. Not that any of this has a bearing on the result of the incident, it is just food for thought so to speak. Generally speaking the VPS should be zero above 100ft or so. Thanks everyone for your answer. It seems, by looking at the graph above, that if it weren’t for the obstacle avoidance system errors, that it would have had successful descended, maybe not fully, but to 50-40-30m which is still incomparably better than 10x more the altitude. Unfortunately, there is still no specific law when it comes to drones in my country (Bosnia), so basically everything is allowed (+120m alt. Fly with no line of sight, fly at night etc. Etc.). But, I am not an inexperienced operator and I see that I made a huge mistake. It had around 70% battery when I started the mission and I wanted to test it at night and hard conditions. I wasn’t thinking about the consequences and fortunately, there are minimal populated areas, where I flied. I just hope that I find the drone tomorrow. It leaves such a small print though… but, hope dies last. It seems, by looking at the graph above, that if it weren’t for the obstacle avoidance system errors, that it would have had successful descended, maybe not fully, but to 50-40-30m which is still incomparably better than 10x more the altitude. The only issue with that theory is the battery. I highly doubt it proceeded any farther than the last log entry. This is where the data ended. Also, in theory, since you had signal at the last log entry, and your battery was already below the cutoff value, the battery shut down at that point and ceased to transmit data at the time aircraft power was lost. The VPS signals do look odd, but that may or may not have an effect on the issue. Looking at the data here, you can see full down throttle and the non-responce from the RC due to force landing, that was very slowly ( As expected ) descending. I will presume for the moment that down throttle during autoland, or force land will have no effect on the AC. On the other side, up throttle will. The flight mode switched to Forced Landing somewhere between 3m 33.9s and 3m 34s in the flight log. Some data is missing between those points in the log, but it appears the downward sensors were detecting an obstacle below the drone while the OP had the throttle in the full down position (which causes that switch to Forced Landing). Since the drone was already landing, it did not attempt to auto land due to a critically low battery after that point. Normally, the drone would slowly ascend when in Forced Landing mode whenever it detects an obstacle below. Since the OP had the throttle in the full down position, that counteracted the slow ascent (causing a slow descent). At the beginning of the descent, that full throttle down caused a faster descent since the downward sensors were detecting an obstacle below on and off. You can see that at the beginning of the light blue section in your graph above. So, in this case, the full throttle down certainly had an affect on the drone. Unfortunately, the rate of descent was too slow for the drone to make it to the ground at that high altitude. If the downward sensors were not being triggered, it most likely would have safely landed. Hey guys! Guess what, good news! Found it finally, 12 days later haha. The snow melted at last and I searched and searched and found it! It landed vertical, which is very unusual but I reckon it was because of soft earth, which my neighbors use for agriculture. Plus it was very deep snow when it fell. And the drone? The drone is a bit muddy but in unscathed condition! Mind=blown. It is very moist I suppose and I put in a bag of rice. I’ll leave it there for 2 days and try and see if it works. If it does then… awesome haha. Just wanted to say a huge thanks to all of you that helped me. And yeah, the drone was so-so in that perimeter, a bit more on the eastern side. There’s a lesson in this of course! Battery and sensors need attention! Glad to hear you had it back safely and that nobody got hurt.